Christian Lopez is a 19-year-old with the soul of a 65-year-old Appalachian mountain musician hidden away inside, steeped in the roots of his West Virginia upbringing in Martinsburg in the Eastern Panhandle of the state. 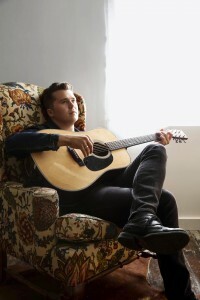 On his debut full-length effort, ONWARD, the young artist emulates the sound produced by the region’s resident pickers and strummers, writing all but one of the songs on the album. Highlights include the Old Testament gravity of the focus track, “Leaving It Out,” the plaintive, yearning lament of “Seven Years,” the twangy pedal steel guitar lacing through “Morning Rise” and the whistling-past-the-graveyards fatalism of the ghostly goth-gospel “Oh Those Tombs,” a song Christian discovered in the public domain popularized by Hank Williams. Christian’s impressive melding of influences into something identifiably his own ranges from the classic rebel country of Kris Kristofferson (“Morning Rise”) to the lyrical folk-rock of Jackson Browne and James Taylor (“Take You Away,” “The Man I Was Before”); from the classic rockers in his dad’s record collection like AC/DC, Pink Floyd, Van Halen, Foreigner and Free ( “Goodbye”) to the neo-Americana revival of the Avett Brothers (“Don’t Know How”), which first prompted him to unplug his electric Les Paul to prove you can “rock your face off” with an acoustic. There’s even a hint of world music in the Middle Eastern rage-by-way-of Celtic jig of “Stay with You,” which builds to its own impressive, operatic Orbison-esque climax. If his previous five-song Pilot EP was, in Christian’s own words, about adolescent relationships, ONWARD is about the responsibilities and sacrifices that come with pursuing something you are driven to do. Songs like “Seven Years” and “Pick Me Up” are about moving inexorably forward, forced to leave those you love behind, even while keeping them close. The conflicts described in “Stay with You” and “Will I See You Again” could be summarized in the phrase, “should I stay or should I go,” while the gravity of “Leaving It Out” and the orchestral benediction of the closing “Goodbye” confront mortality itself with hope, optimism and joy intact. ONWARD is about yearning to put down some roots, but being hopelessly addicted to the wanderlust of the road, seeking to escape the day-to-day for the promise of what tomorrow may bring. “I wanted less effects on my vocals, a drier, more present sound,” he explains. “Less touched-up elements in the production, with everything right on the surface, not too much make-up, and Dave Cobb is the guy to go to for that. He’s such a genuine producer, who makes music in such a pure, old-school way. He’s the right person for the job. Although he’s been playing piano since he was five (introduced to it by his music teacher mom, an opera and classical music lover) and guitar at six, in several garage bands along the way, Lopez has only been performing his own music in front of people for the last couple of years. He performed the single, “Will I See You Again,” which he re-recorded for the new album, at the Fillmore in Charlotte, NC, when he was declared the winner of last year’s Belk Modern Musician Showcase, which landed him a spot on their tour. Christian Lopez Band has also opened for both Zac Brown Band and Dave Matthews Band, along with a stint on the Vans Warped Tour. 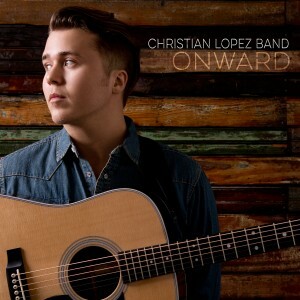 For the Christian Lopez Band, everything from here is ONWARD. Click thumbnail to open high-res image then right click to save. Copyright ® All Eyes Media. All rights reserved.